The Automatic rewind line of Toilet Rolls Machine is a complete, integrated system that produces a wide variety of products. 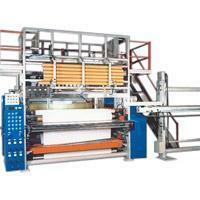 Easy production process - Start and finish can choose manual / auto, finished products can be set up from sheet, Dia. and length. All perforation, slitting, rewinding, trim and tail sealer completed in one machine. Special design of sprial perforator keeps very low noise and long service life. Slitting system use air control, easy to repairs and moves. Option Equipment for the Toilet Rolls Machine: Single / Double / Edge Emboss Section & Flexo-Printer and variety of equipment on rewinder. If you require for more detail information or request different specifications about our Toilet Rolls Machine, please contact us!